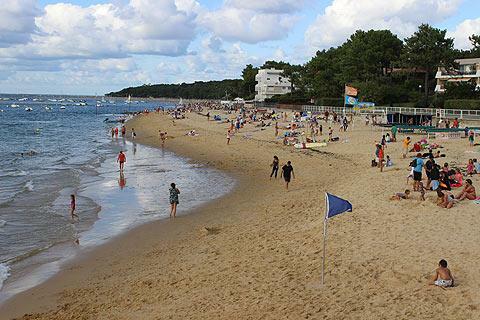 The popular seaside resort at Le Moulleau is actually part of Arcachon - it is the south-west limit of that town - but has its own separate resort centre, facilities and characteristics. 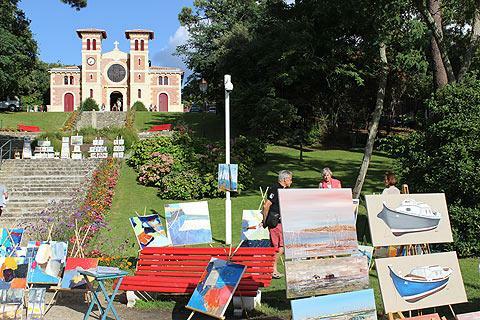 Although it has quite a small centre, Le Moulleau has everything you will need for your visit to the Atlantic beaches of south-west France. Centred around the jetty in the centre of the village, it is of course the long sandy beaches to either side of the jetty that are the principal attraction to visitors. You can stay close to the jetty or, if you are looking for peace and quiet, just keep walking! Continue north and the beach carries on passed Pereire Beach and on to Arcachon centre, or continue south to Pyla-sur-Mer and beyond. Either way you will find plenty of beach continuing for many kilometres in either direction. 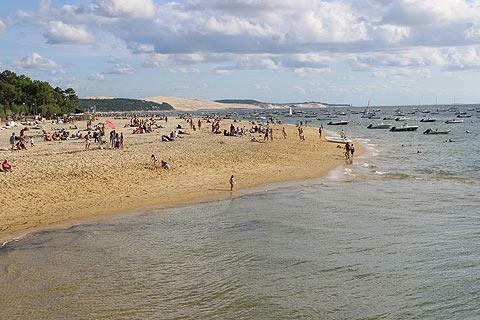 From the jetty itself you have far reaching views, both across the Bassin d'Arcachon to Cap Ferret, and south along the coast to the remarkable Dune de Pyla. In summer months there is a ferry that operates three times a day between Le Moulleau and Arcachon and only costs one euro per person each way - an excellent way to travel between them without needing to pay for parking in Arcachon itself! On the seafront here you can see a bronze Napoleonic cannon, discovered when the Grand Hotel was being built at the end of the 19th century. Behind the jetty the main street in Le Moulleau has lots of restaurants, bars, ice cream stalls and small shops and boutiques and is a pleasant, lively place. During the summer various exhibitions are also held here. Continuing along this street, you can't help notice the large church that dominates the town and stands on the hill (really a sand dune) behind Le Moulleau. 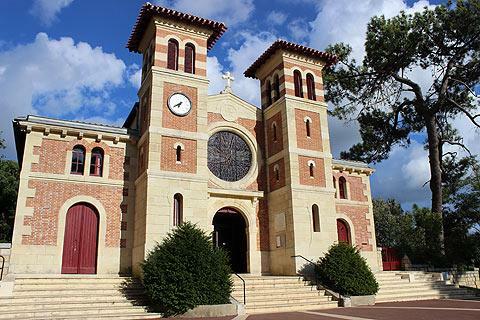 This is the Church of Notre Dame des Passes, and was built in the 1860's in the neo-byzantine style at the time that the resort first started to develop. The church is named for the 'passes' that sailors need to follow to enter the Arcachon basin. Although it is a relatively recent church it is interesting to visit, both for the colourful decoration, in particular in the altar area, but in particular for the views from the terrace in front of the church. 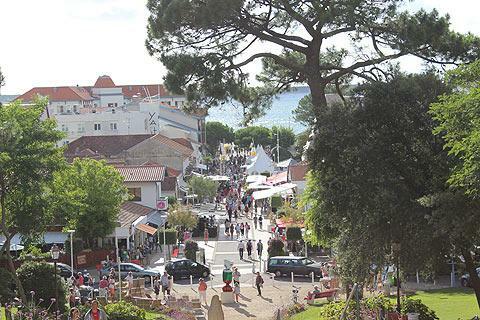 The view from the church terrace follows a straight line along the main street and jetty in Le Moulleau and across the Bassin d'Arcachon to the lighthouse at Cap Ferret. Of course, being just a few kilometres from Arcachon centre you will want to visit and explore the many highlights of that lovely town. From the beach at Le Moulleau you can hardly miss the sight of the great sand dune a few kilometres to the south of here: this is the Dune de Pyla, the largest sand dune in Europe. This dune is an unmissable local highlight at the south-west corner of the Bassin d'Arcachon which you can climb to have great views out to sea and across the forests of the region. Extremely popular with visitors and highly recommended! You can find more local travel ideas in the Gironde guide and the Gironde guide.